The Coast Walk in One Day or Two? I have hiked the Coast Walk in Royal National Park so many times I’ve lost count. A few years ago, I tried and gave up at more than one hundred. Seriously. 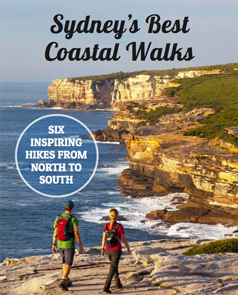 When I founded Sydney Coast Walks in 2009 I was the only guide, and the two-day Coast Track was the only walk. But I’ve only done the full Royal Coast Track in one day twice; both times for a charity challenge walk (find all this year’s walking events here). The latest was for the inaugural Walk for Lifehouse, raising funds for Chris O’Brien Lifehouse, a cancer care clinic near Royal Prince Alfred Hospital, with 110 dedicated walkers. The best thing about hiking the Coast Walk in just one day is that you’re only carrying a daypack (I still love my well-worn 28 litre Osprey Kestrel). The weightlessness on your back makes you feel you could fly along the 28km (although, if you’ve never done an overnight hike you may not fully appreciate how great this is!). On the two charity events we’ve supervised that walked the coast track in one day, walkers took between six and nine hours to complete it, including a short-medium break for lunch, and pausing only for a drink on the track. No stopping to enjoy the views, no photo opportunities, no whale watching. The difference in completion time was their level of fitness, determination and walking pace. One of our supervisors, Caro from LotsaFreshAir, accompanied the keen beans right up the front who did the track in six hours. She said she didn’t see anything – just head down, legs pumping. But wow, what a sense of challenge; the satisfaction of completing something big and worthwhile. For Walk with Lifehouse, I was Tail End Charlie, accompanying the last walkers who took about nine hours to finish. I didn’t see much more than Caro really, because the pace was slower due to fitness and natural pace, rather than sight-seeing. I only stopped at the top of Thelma Head, between North Era and Garie Beach, to turn around and enjoy the view south while waiting for someone, glimpsed Eagle Rock and Wedding Cake Rock on the way past, and paused at The Balconies for a photo. Oh, and lunch at Wattamolla too. That’s it. If you’re training for a longer trek, the Coast Track in one day is perfect. There are enough ups and downs to challenge you (about 1244 metres of ascents and descents combined). I was more footsore after nine hours of solid bushwalking, than the usual two days carrying a heavy pack. Longer time on my feet meant a longer recovery period. If you’re going to do the Coast Walk in Royal National Park in one day, then I recommend walking from Otford to Bundeena. Yes, you're walking into the sun but trains only stop at Otford every two hours on a weekend. It’s easier to make the infrequent train timetable suit your start time and the ferry from Bundeena to Cronulla departs hourly until 7pm (6pm in winter). Read more about how to get to the Coast Track. Also, the southern part of Royal Coast Track is more hilly than the northern end. If you’re doing the Coast Track in one day, by starting at Otford you get the hardest part done first when you still have energy. By doing the walk from Otford to Bundeena you also start by heading downhill through the Palm Jungle, rather than having this as a final uphill slog if you start at Bundeena. Make an early start though, the section across the flat sandstone as you approach Bundeena is very hot and exposed on a summer day. You may want to stay nearby the night before your walk. Here's more about accommodation near Royal National Park. Still my preferred option, absolutely. Fine, I’ll admit you have to carry everything to camp overnight at North Era (see our comprehensive hiking checklist for what to take), but it’s just so much more enjoyable. Enjoy the camaraderie on the trail and around camp that night. Start your second day’s walk with a hot cuppa overlooking North Era beach (check National Park’s campsite bookings). You can afford to take way more breaks on both days, including a deserted beach swim and whale watching in season (the only whale we saw when we did it in one day was during the pre-walk briefing). If you’re an early riser, and the tides are right, consider adding a side-trip to Figure 8 Pools from Burning Palms Beach, but be aware it will add a few hours to your day. There’s more time to enjoy wallabies and other native birds and animals in Royal National Park, as well as the wildflowers. Royal’s wildflowers are a humble lot that deserve closer inspection to appreciate their intricate, not flashy detail. I prefer walking Royal National Park Coastal Walk north to south, that is from Bundeena to Otford. Of the hundred-plus times I’ve walked the Coast Track in two days, 90% have started at Bundeena. The first day to North Era is longer, but the views are much nicer walking this way and the sun is on your back, not in your face. Yes, you finish uphill through Palm Jungle but you don’t really need to leave camp until after lunch, so you’re well rested from the first day. When people say, “but you can do it in one day!”, now you can answer that just because you can, doesn’t mean you want to. Up to you. Tagged Royal Coast Track, Royal National Park. Wish I was back in Aus – keep up the good work Ian and Tara. Thanks Ben. We can help you live vicariously until next time you’re here. 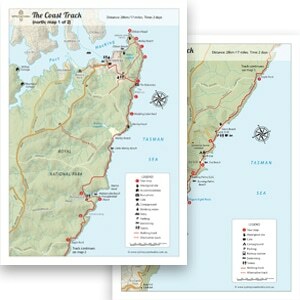 Download the Coast Track Map here.